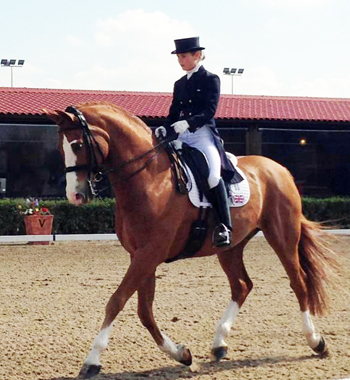 Spanish dressage has just made leaps and bounds in advancing its dressage circuit by hosting the first ever CDI4* on home soil. And I have to say there was a lot of excitement and anticipation for this show among enthusiasts in Spain and, indeed, all over Europe. Held at the fabulous “Can Alzina” – home of Barcelona Horses and just 30 minutes outside the beautiful city of Barcelona; this show was the brain child of the Elias Lara family and they have worked tirelessly to make it a success. With the blow of Dehesa Montenmedio giving up holding the CDI3* Sunshine Tour, Spain was in need of an enthusiastic team to hold an International Spring Tour show and I can’t think of a more lovely location than Can Alzina, or a better team than the organisers supported by TopIberian and all their fabulous sponsors. So bags packed and alarm clock set, we were up at an unearthly hour to get to the airport to fly from Malaga to Barcelona. A four and a half hour flight delay and much airport duty-free shopping later, we landed, rushed off to find our hire car and make our way to the show ground, which was about a 45 minute drive to very near the lovely town of Sabadell. Despite excellent directions and a Sat Nav, we were absolutely THRILLED to see signs to the show on every single roundabout from a a long way away – the first gold star awarded before we even arrived! Sometimes the shows can be hellish to find. 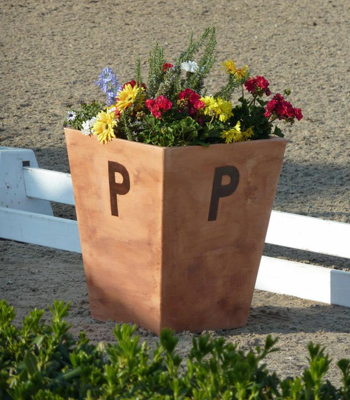 Arriving at the show ground, we were welcomed into a pleasant, calm atmosphere of professional dressage with classes in full swing in both arenas. The showground is compact with everything no more than a few steps away in any direction. A lot of thought had gone into making it a wonderful place to compete – tight enough to not be exhausted walking back and forth but spacious enough to fit in the many competitors and spectators. Despite our flight delay, we arrived in time to watch the majority of the 42 strong PSG class and were treated to many super, high quality tests from riders hailing from a variety of different countries. Flitting between the competition arena and the warm- up gave so many of the spectators a real opportunity to see the “whole” experience. A real testament to how enthusiastic Spanish riders are about the sport, was how many National level riders had flown or driven to the show and were absorbing the training and riding methods of world class riders the show had attracted. 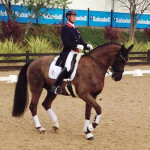 Carl Hester, Edward Gal and Hans Peter Minderhoud were at the top of everyone’s list to watch. Whilst Carl Hester has been to the Sunshine Tour in Vejer on various occasions, this was the first opportunity to see Edward and Hans Peter on Spanish soil. The PSG class was won by Anders Dahl on an absolutely super horse Selten. The UK based Danish rider wowed both judges and spectators with this lovely, sympathetically ridden, elastic horse. This has to be the one that most people would have been very happy to take home. Many of the top slots were taken by British riders, who were out in force and on fire in Barcelona (Spencer Wilton, Henriette Andersen and Willow Kemp to name but a few). Taking the opportunity to talk to Spanish friends riding there, everyone was impressed by the British riders, with one person remarking that every single Brit they saw was riding really well and the strength of the sport in the UK must really be on the up – “even the riders not on the team ride were riding fantastically”. I explained about Lottery Funded Sport and the World Class training that backs up British Dressage which is certainly helping to make Britain a force to be reckoned with on the world stage and the Spanish friend agreed that you can now see the impressive results. Riders from Holland and Spain should not be forgotten, it was a veritable feast of excellence! Having excused ourselves early that night and getting hopelessly lost trying to find our hotel in nearby Sabadell (if only it was as well signposted as the show and the Sat Nav had taken us to the front of the hotel and not the back! 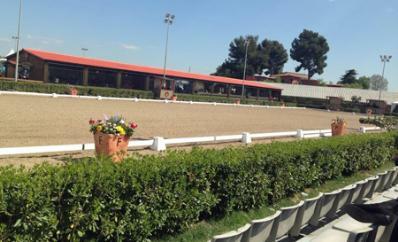 ), we rested up to return to watch the start on the class everyone was dying to see – the Grand Prix! Some 47 riders from 14 nations were battling for the top slot over two days and the show was PACKED out. Despite being freezing, the number of spectators watching both the warming-up and the class was immense, not a ring side space was to be found. As it was the only class running, the warming-up had been moved to the second competition arena – a handy 12 steps from the competition arena on the other side of the restaurant. Watching the top riders working their Grand Prix horses was a joy – lightness, elegance and power were key components, although there were a few fairly hot looking horses being beautifully steered round in the quite electric atmosphere. The two days of Grand Prix tests culminated in Edward Gal being crowned winner, with Carl Hester taking the runner up spot on Dances with Wolves (of whom there is a video on Horse Hero, in his early days with the late Jane Gregory). What a lovely horse and superbly ridden (as expected) even though he was looking a tad sharp. 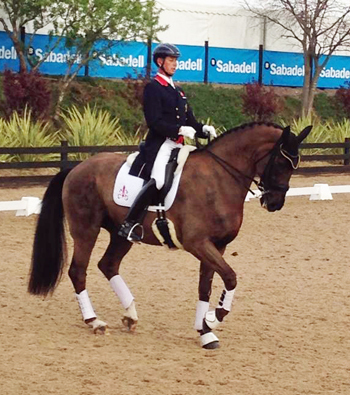 Spanish rider Beatriz Ferrer Salat finished 3rd with the impressive Sir Radjah. I can’t go on without mentioning Spanish rider Carmen Naesgaard who is from our local area in the Malaga region and who did a brilliant test on her very sharp little powerhouse Ricardo to finish 6th. This is only his third test at Grand Prix and I haven’t personally seen him compete since his last one in the late summer. WOW, what an improvement in such a short time! It goes to show what hard work can achieve. There were so many impressive tests, beautiful classy horses and excellent riding, that it would be hard to mention everyone. I was also impressed by an unassuming rider from Estonia who came quietly into the arena with no bells or whistles and did a super correct test. Unfortunately, only being correct doesn’t win the class but it’s a really good place to start and she went on the next day to be 4th in the Special. Good job! The prize-giving ceremonies for all the classes were held to rapturous applause. How nice to make a proper spectacle of the prize-giving with super sponsors and riders getting the commendation for a job well done. Sometimes, the prize giving can be a little bit an anti-climax after the thrill of a place in the class – a job to get done quickly so everyone can go home. But not in this case; if there had been a roof on the grounds, it would have been brought down with the applause, no wonder Carl Hester borrowed a horse for the occassion! There were also additional displays held to entertain the crowds; Santi Serra and his freedom horses were particularly impressive. It is truly amazing that there is no end to what these wonderful creatures will do for us. We were also treated to a party on the Friday night with an Irish band in “The Holding Box” restaurant. The place was packed to the rafters and there were a few sore heads on Saturday which was sadly our last day at the show so we also missed the lovely closing dinner which I’m told was brilliant! Managing to have a light spending spree in the various trade stands and have a proper catch-up with friends old and new, made the trip well worthwhile before sadly having to leave to catch our flight back to Malaga. All in all, the competition was a roaring success. Impressive entries for the classes, riders making the trip to Barcelona from all over Europe and the show organisers trying their upmost to cater for every eventuality. Nice stabling for the horses, lunging pens in the show-box areas, proper wash downs, ample parking and even a horse drawn “taxi” to take you to the stable area. What an impressive start to the competition and long may it continue! Co-incidentally, there are now many riders in Spain who went home with the inspiration to train their horses up, to be able to come compete at this prestigious show and I’m one of them. Bring on 2015!